"In 2018, we took advantage of the continued consumer shift toward light-trucks, contributing to another record year for our Honda and Acura light-truck businesses," said Henio Arcangeli Jr., senior vice president of the American Honda Automobile Division. 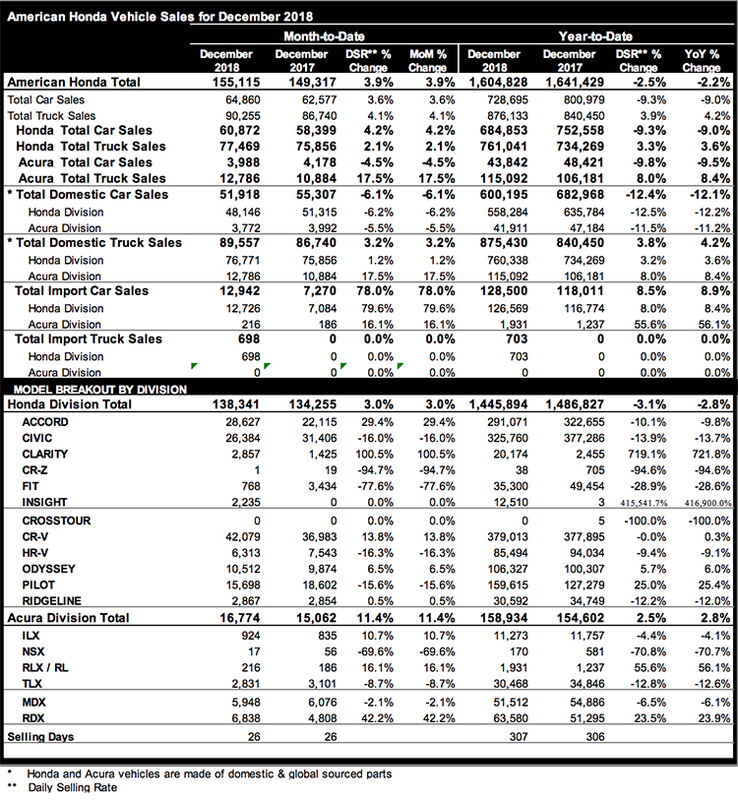 "In addition to our light-truck success, our passenger car business also delivered another strong year, with Civic retaining its crown in 2018 as the best-selling retail compact car in America for nine years running and Accord commanding the highest transaction prices in the midsize segment. We remain bullish on the passenger car business and look forward to another great year in 2019 across our entire Honda and Acura lineups." Honda finished 2018 on a strong note with both cars and trucks gaining in December, overcoming over four months of lost production due to a flood that shut the Celaya, Mexico auto plant to narrowly miss a new annual sales mark. Truck sales set new monthly and annual records led by CR-V which set an all-time monthly record, with 42,079 units in December, a gain of 13.8%. Pilot set a new annual mark, eclipsing its previous record by over 7,000. Accord jumped a strong 29.4% on 28,627 in sales for the month. Electrified vehicle sales set new monthly and annual sales records with 6,899 December sales, the 6th straight month above 5,000 units. Acura was one of the few luxury brands to increase sales (+2.8%) in 2018, setting records for RDX and light trucks, leading to new market share and the brand’s first annual gain since 2014. ILX and RLX sedans gained in December, with ILX up 10.7% and RLX gaining 16.1% (its best month in 2018).